Be the first to share your favorite memory, photo or story of Waneta. This memorial page is dedicated for family, friends and future generations to celebrate the life of their loved one. MT. 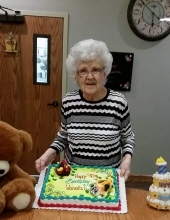 PULASKI - Waneta Febus Milner Stephens, 97, passed away at 9:10 a.m. on Thursday February 7, 2019 at Vonderlieth Living Center. Waneta is survived by her children: Harry Wayne (Valera) Milner of Sherman, IL and Lisa Brown of Mt. Pulaski, IL; grandchildren: Karla Newton of Edwardsville, IL, Patrick (Vicki) Newton of Wentzville, MO, Tim (Julie) Milner, Kara (Jeremy) Davis of Mt. Pulaski, IL, and Clayton (Alicia) Brown of Mt. Pulaski, IL; step children: Jeff, Ben, and Kathy Stephens; one niece: Cynthia Hill of Elgin, IL, and fifteen great-grandchildren and eight great-great grandchildren. She was preceded in death by her parents, her brother: Wayne Febus, sister-in-law: Jeanne Febus, and son-in-law Bob Brown. Services for Waneta will be 11:00 a.m. Tuesday February 19, 2019 at Mt. Pulaski Christian Church with Mark Weber officiating. Visitation will be one hour prior to service. Burial at Mt. Pulaski Cemetery will follow the service. Memorials may be made in Waneta’s name to Mt. Pulaski Christian Church, Humane Society of Logan County, or Mt. Pulaski Historical Society. Services are entrusted to Fricke-Calvert-Schrader Funeral Home in Mt. Pulaski, IL. "Email Address" would like to share the life celebration of Waneta Febus Milner Stephens. Click on the "link" to go to share a favorite memory or leave a condolence message for the family.